“Every keyboardist should own a good harpsichord and a good clavichord to enable him to play all things interchangeably. A good clavichordist makes an accomplished harpsichordist, but not so the reverse. The clavichord is needed for the study of good performance, and the harpsichord to develop proper finger strength.” With these words from his 1753 Versuch über die wahre Art, das Clavier zu spielen, Carl Philipp Emanuel Bach joined his father, Johann Sebastian, in his praise of the clavichord as a keyboard instrument suitable for performing, teaching, composing and practicing. The action of the clavichord is unique among all keyboard instruments in that the depression of a keyed lever causes a wedge-shaped “tangent” to rise and strike a metal string in order to set it into motion as well as define its length and, therefore, pitch. Because of this intimate connection between the player’s fingers and the vibrating string, the clavichordist is able to control attack, duration, and even a type of vibrato, unique to the clavichord, called Bebung. 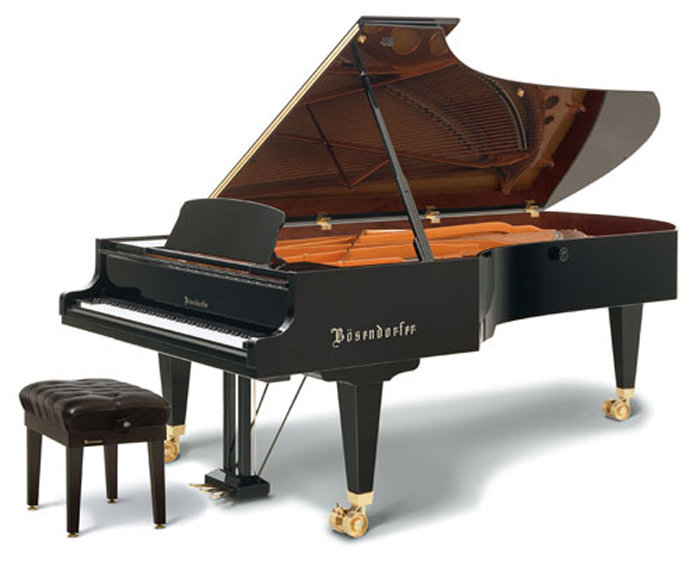 The instrument’s expressiveness, however, is limited by its extremely low sound power output, and, as a result, clavichord performances are mostly limited to small rooms. 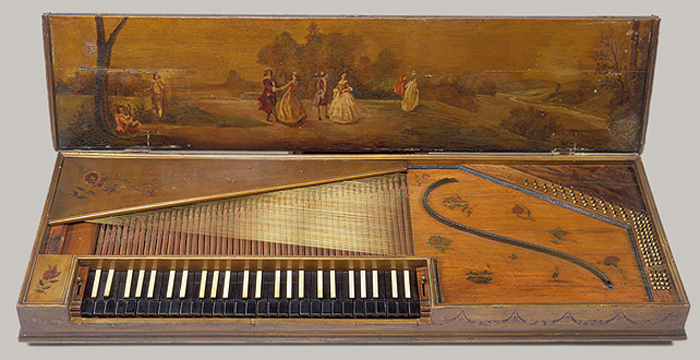 The earliest clavichords were “fretted” in that a single string could be used to create more than one pitch, depending on where along its length it was struck by a tangent. Unfretted clavichords with a single note per string, however, appeared by the late seventeenth century. They allowed their players to more readily adjust the size of each interval and thereby establish a temperament that might enable performances in all keys and, eventually, modulation into distant keys. Instruments with such capabilities probably inspired Johann Sebastian Bach’s The Well-Tempered Clavier Books I and II (BWV 846-69 and BWV 870-93), published in 1722 and 1742, but no records describing Bach’s instruments or their builders’ identities have survived. Much of the solo repertoire written between 1400 and 1800 for organ, harpsichord and fortepiano can be played on various forms of the clavichord, but, with the possible exception of providing very light accompaniment to a Baroque traverse flute, recorder, or single singer, the clavichord is an unsuitable partner in chamber music. Christopher Hogwood performs Partite diverse sopra il Corale “O Gott, du frommer Gott” (BWV 767) on a clavichord recording, entitled The Secret Bach, released on the Metronome label. The liner notes for that compact disc include an essay by Derek Adlam, historic instrument builder and restorer, performer, and President of the British Clavichord Society. 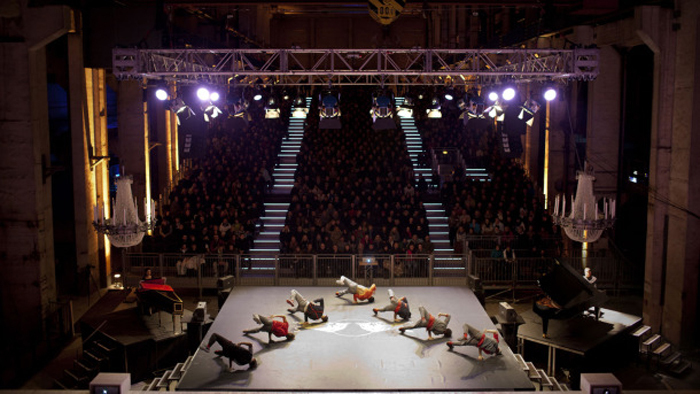 Breakdancers Flying Steps have returned to trafo/Kraftwerk, a decommissioned power plant in the Mitte section of Berlin, for two additional weeks of performances of Flying Bach, featuring the first six pairs of preludes and fugues from Bach’s The Well-Tempered Clavier Book I (BWV 846-851) and Toccata and Fugue in D minor (BWV 565). As soon as I saw the Deutsche Welle video in September, I knew that I wanted to see Flying Bach when I got to Berlin in December, but it wasn’t until early November that I realized that tickets were sold out and that I would have to wait until I got to Berlin to get one. Soon after arriving in Berlin and settling into my hosts’ flat in Prenzlauer Berg, I began an online search to find a ticket, but the asking prices for scalped tickets were so high that I decided to show up at the door every night, starting 7 December, until I got lucky. So that Wednesday I made up a sign in what I imagined was colloquial Denglisch (“suche 1 Ticket”) rather than proper German (“Eine Eintrittskarte wird erwünscht”) and headed out in the rain to the U-Bahn station at Senefelder Platz. Four stops later, after passing below Alexanderplatz, I emerged from the Märkisches Museum station and began walking east, looking all around me for any sign of trafo/Kraftwerk. Well, that certainly proved to be no problem as the former power plant’s huge smokestacks were brightly illuminated, and it crossed my mind if they’d been bathed in red light, rather than blue, they might have inspired the logo for the Konsumgenossenschaft, one of the few outlets for consumer goods in the former German Democratic Republic, that featured a “K” fashioned from a smokestack and a sickle. Anyway, the crowd was already lining up at 6:30pm because there was no assigned seating and the doors were going to open at 7:00pm for an 8:00pm show. I entered the gate controlling access to the small parking lot, walked to the front of the line, saw that no-one was offering tickets, and realized that my best bet was to return to the gate and stand there emotionlessly with my very powerful sign. But before I could even get the sign out of my pocket, a man arrived at the gate and asked if I could use an unneeded ticket. I was immediately overcome with a rush of relief as I realized that I was not only going to get to see Flying Bach that very night, but I was also going to be able to pull off my ideal schedule for the remainder of the week. So, it turns out that this guy’s girlfriend had bought a pair of tickets, but she’d fallen ill and couldn’t go and made him promise that he’d go without her and he’d better “have a good time anyway, dammit.” Well, “Dirk” really had no idea who the Flying Steps were and had, after all, expected his girlfriend to tell him what was going on, so I was happy to step forward and offer to serve as his guide to Bach and whatever else was happening. Not that I knew anything about hip-hop or breakdancing (Where are my sons when I need them? ), but I hoped that I’d watched at least enough YouTube and read enough Wikipedia to not be entirely clueless about the urban arts. 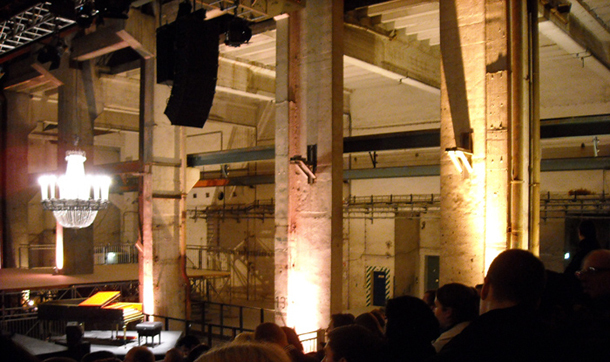 However, that really never became an issue it was the scene inside the old industrial building that I, a habitué of formal concerts, was totally unprepared for. As soon as the doors were opened, the crowd began to surge behind us, and we found ourselves scrambling up fantastic staircases as painted scenes from the Flying Bach tour flashed by. We climbed up and up without stopping, the air warming as we got higher and higher, crazy beams and columns grabbed at us from every side, overhead rolling cranes threatened our scalps, until we finally reached a peaceful cross aisle separating banks of audience seating. We grabbed two seats at the end of the last row at the top of the first seating section and immediately realized that our sightlines to the performance platform were going to be perfect. 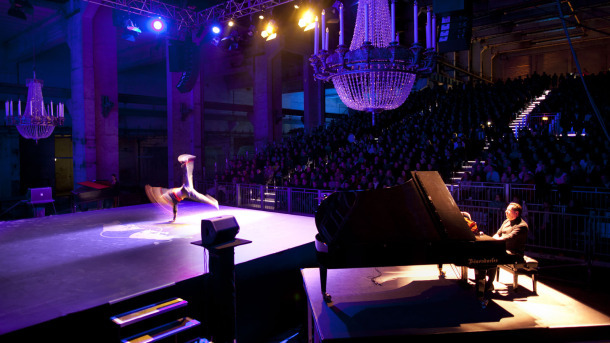 A Bösendorfer Imperial Grand stretched across the left side of the stage, a two-manualed harpsichord stood to the right, crystal chandeliers were suspended above both, but other than that, the raw concrete of the found space was to serve as the scenery. An hour quickly passed in conversation. I learned how Dirk’s family had emigrated from the East to the West, how his mom immediately fled for the US, forcing his dad and him to move back to the East, how it had felt to have had the rug pulled out from under him when the two Germanys were unified, how he was barely eking out a living as an actor in television commercials. German culture: The music of J. S. Bach. And then the spell was broken, and we were plunged headlong into a fugue. On to our feet. Applause. The crowd crushes towards the stairways. I say “so long” to Dirk, but there’s no time to hear what he thought of it. Back down the stairs. (No, I don’t want to buy a 50 Euro hoodie.) Through the gate. Back into the quiet side streets. 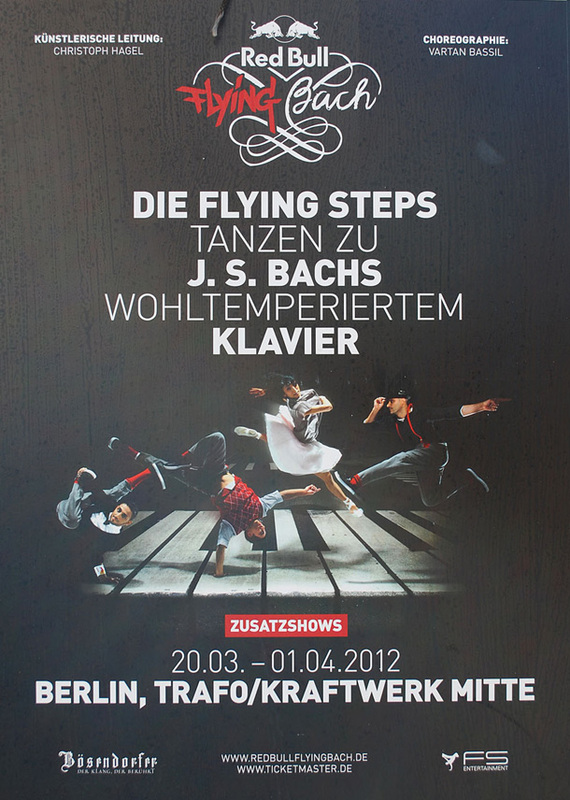 Flying Bach was one of the most exciting performances I’ve ever been to in my entire life. This summer’s Bachfest Leipzig will include a production of Johann Adolph Hasse’s Cleofide, which is thought to have been seen by Johann Sebastian Bach and his eldest son, Wilhelm Friedemann, at its 1731 premiere in Dresden. 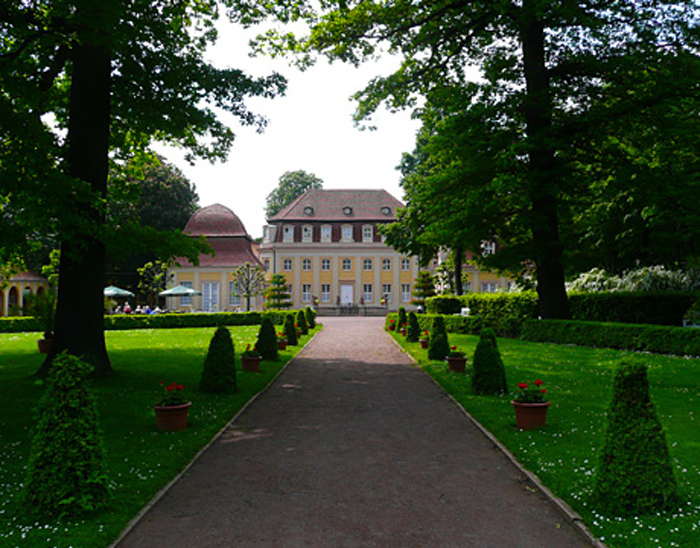 Both performances of the opera, on 13 and 14 June 2012, will take place in the Goethe-Theater located in Bad Lauchstädt, a small resort town located about 50km west of Leipzig. While this Festival production will retain most of the Italian-language arias and ensembles, the recitatives will be replaced with a German-speaking narrator charged with telling the two and one half hour story of an Indian Queen caught between the attentions of Alexander the Great and the affections of her long-time lover. Although Cleofide is generally considered to be Hasse’s greatest operatic success, it is possible that as many Festival patrons will be traveling to Bad Lauchstädt for the scenic novelty of the production as for the aural experience. Originally built in 1802, the relatively dimly-lit stage of the Goethe-Theater is outfitted with the types of scene-change mechanisms that represented the state-of-the-art in the eighteenth century. 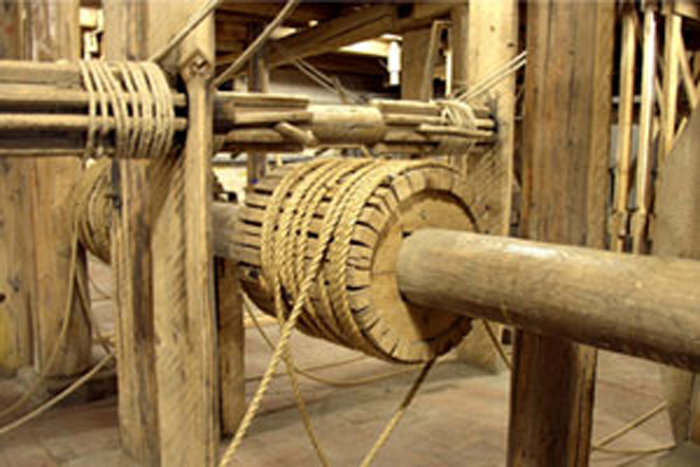 Through the use of a system of interconnected windlasses, pulleys and ropes, a receding series of painted linen flats and borders, depicting the interior of a sumptuous palace, can be instantaneously exchanged for other perspectives, such as a wind-swept snow field or a moon-lit forest. 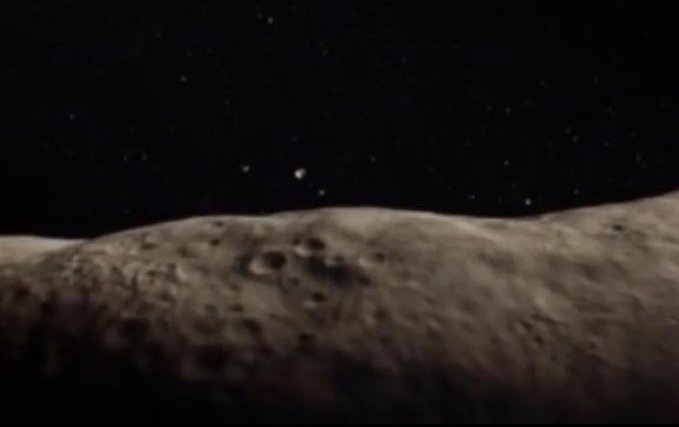 Many twenty-first century audience members find such special effects, which were widespread in the Baroque era, to be as astonishing as some of those experienced in modern films. 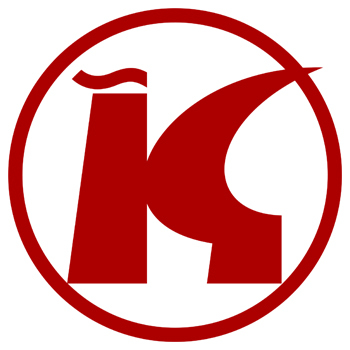 Because of the special attention paid to historical theatrical performance practices at the Goethe-Theater, Perspectiv – Association of Historic Theaters in Europe, which is dedicated to the conservation and restoration of historic theaters, has included the Goethe-Theater on its European Route of Historic Theaters. 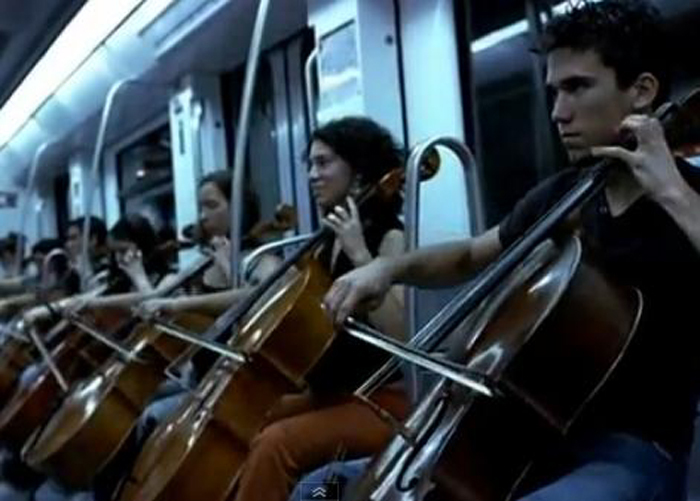 The Spanish director Pere Portabella’s  film brings Bach’s music to life with a mysterious, magnificent blend of drama, documentary, and quasi-surrealist whimsy. Beginning with a scene of a player piano rattling off the Goldberg Variations (BWV 988) while rolling through a bright, bare loft, Portabella tickles the senses with a series of skits: a truck driver who plays Bach on the harmonica; Bach himself (the harpsichordist/organist Christian Brembeck) teaching his son Christoph Friedrich music via The Well-Tempered Clavier (BWV 846-69); a Bach impersonator hosting tourists in Leipzig; an orchestra of cellists playing a suite while speeding along in a sleek new subway car; a boat trip through Dresden, where the Goldberg Variations were commissioned, as a guide recounts the 1945 firebombing; a bookseller who speaks to a customer of the horrific abuses of great music in Auschwitz; and Felix Mendelssohn (Daniel Ligorio) discovering the St. Matthew Passion (BWV 244) on a piece of sheet music in which his butcher has wrapped meat. From puckish humor and borderline kitsch, a great and serious notion emerges: modern Europe was built on the foundation of classical music, which, as a result, endures tenaciously there. At the Bach Vespers on 4 March 2012, Boulder Bach Festival soloists Sarah Brailey, Eric Brenner, Daniel Hutchings and Joe Damon Chappel sang the touching aria Es ist nun aus mit meinem Leben (“All is now over with my life”) with exquisite care, paying great respect and honor to its composer, Johann Christoph Bach (1642-1703), and to the memory of Jan Effenberger, a long-time member of the Boulder Bach Festival Chorus. In the 1754 obituary notice for Johann Sebastian Bach, Johann Christoph was cited as being an older Bach who “was as good at inventing beautiful thoughts as he was at expressing words.” Several of his works, including Es ist nun aus, were so revered by Johann Sebastian’s father, Johann Ambrosius, that he included them in the Altbachisches Archiv, a collection of autographs by members of the Bach family. The archive was moved from its home at the Sing-Akademie zu Berlin to a castle in Lower Silesia during the Second World War in hopes of preventing its destruction, but, mysteriously, the collection disappeared soon thereafter. Fifty years later it resurfaced in a Ukrainian library and was returned to the Sing-Akademie in 2001. 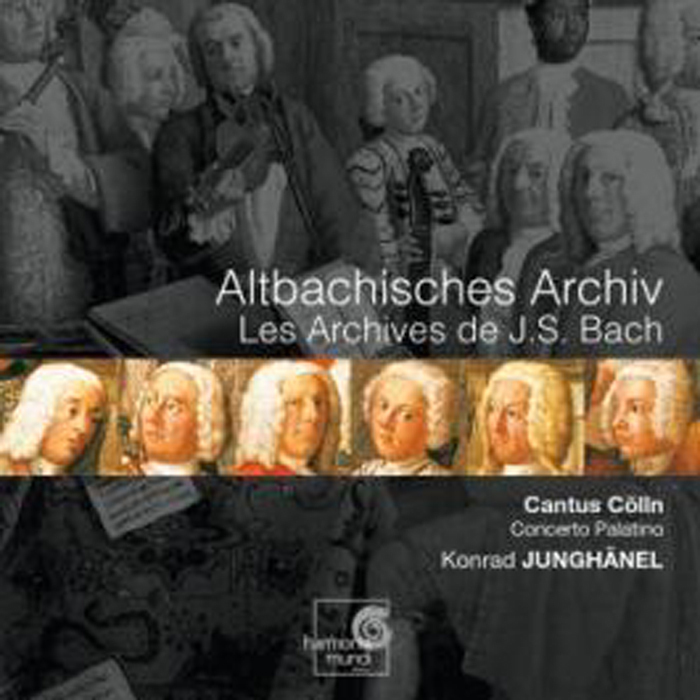 A recording by Cantus Cölln and Concerto Palatino of the entire Altbachisches Archiv, under the direction of Konrad Junghänel, was subsequently released by harmonia mundi. 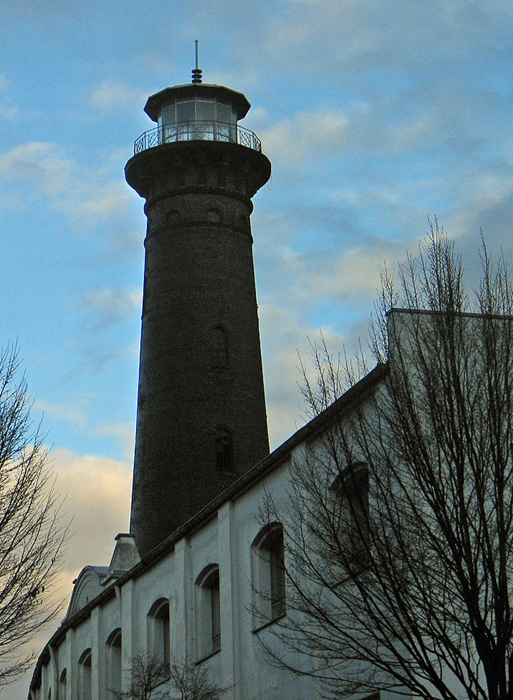 The Center for Early Music, operated by The Cologne Society for Early Music, has found a new home within the walls of a former lightbulb factory boldly topped with a lighthouse. 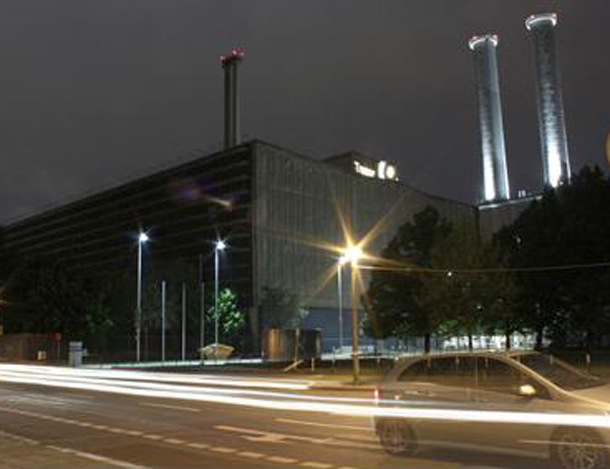 This repurposed “Helios Tower” now serves as a powerful beacon for all Early Music organizations in Germany that must compete for limited public and private funding. By pooling their resources, Concerto Köln, Capella Coloniensis, Das Neue Orchester and Cantus Cölln are able to share a rehearsal hall, several harpsichords and a fortepiano, and soon, after a second phase of construction has been completed, office spaces and guest rooms for visiting musicians will be available to all collaborators. Not surprisingly, a social network for Early Music has sprung up at the Helios site. Musicians who had never before worked together have found each other at the Center and have begun to develop joint projects, and when a request for a concert appearance cannot be fulfilled by one ensemble, it’s only a short walk to alert another ensemble of the opportunity. The Society is also expanding its service to the community as The Center has begun offering educational programs to groups that have had little exposure to Early Music. 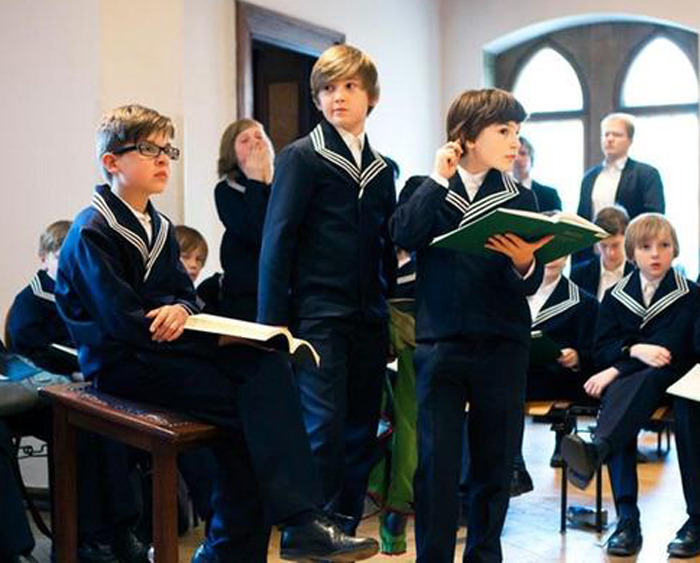 This month the St. Thomas School choir celebrates its 800th anniversary, and to mark the event, film directors and producers Paul Smacznyand Günter Atteln have released Die Thomaner, a German-language documentary recording the lives of the nearly one hundred boys between the ages of nine and eighteen who prepare a Bach cantata for performance each Sunday at St. Thomas Church in Leipzig.